Discovered by Lewis and Clark in 1806, this native is still somewhat rare in the nursery industry. It grows well, and has many features to commend it. The grass-green needles turn a bright gold in autumn before dropping to reveal the branch structure and cones. The tree has short branches and a heavy trunk. It can be used in narrower situations than many conifers. This is a good addition to a mixed conifer planting, providing seasonal interest. Found on rather moist north-facing slopes, or along streams east of the Cascade summit, this is the only native deciduous conifer in Oregon. 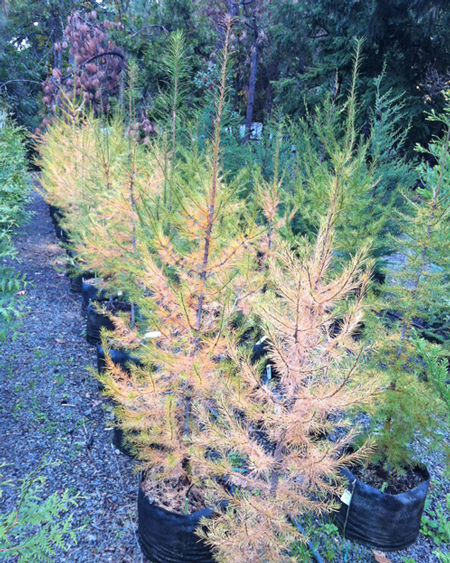 Seldom getting more than 30-50 feet tall in cultivation, larches can grow to 180 feet in the wild, tall and slim. Scaly, reddish-brown bark becomes furrowed with age. Pointed needles, 1-1 ½" long emerge a bright apple green in the spring, have blue tones through the summer, then shine golden in the fall. Winter sets off the slender, conical form, with interesting textures of branch and cones. 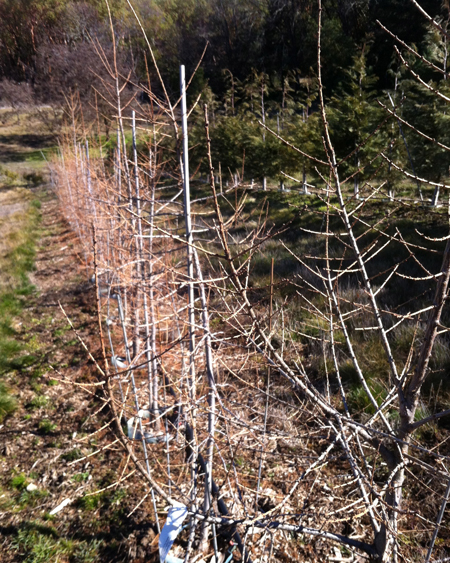 Widely tolerant, the Larch does well in full sun, in any deep, well-drained soil. Our Larix occidentalis in winter. Categories: All Plants, Conifers, Deciduous, Native Plants, Restoration Stock, More..
Conifer Size 10 gallon8 ft.10 ft.15 ft.